Making Women's History: GMU's Women for a Change club partnered with Cari-Ann Christensen and the school administration to bring a truly inspirational speaker to GMU on Thursday as part of Women 's History Month. 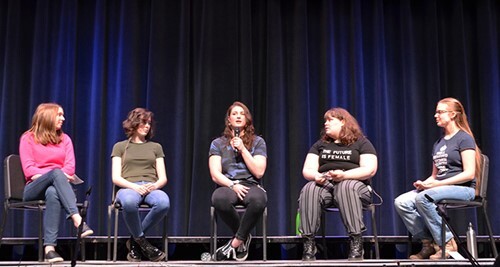 Brooke Bonney (center) appeared along with a panel of Women For Change club members that included (left to right) Natalie Pistor, Maya Farwell, Nina D'Amato, and Anika Christensen. Brooke is the daughter of Mary Williams and GMU JV boys' basketball coach Bruce Bonney. She was a three-year letter winner in track and field at Norwich High School, where she won the Eastern States 100-meter hurdles in her senior year (2014). She was also a member of the National Honor Society. Brooke is a grad student studying cell and molecular biology at Binghamton University and is one of the top Division 1 college track and field athletes on the Northeast. She's currently ranked number 1 in the northeast for weighted throw and number 10 for shot put. She spoke on topics such as self-care, motivation, coachability, and grit.